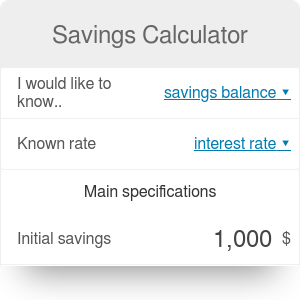 Savings calculator, otherwise called "savings account calculator" is a versatile tool that can help you plan how to save up enough money to buy your dream car, trip, etc. It works in both directions - go ahead to either find out how much you'll save OR how much you need to deposit if you have a certain amount as your goal. It operates on a few variables: initial balance, meaning how much can you put in as an initial deposit; monthly deposit, interest rate and term, meaning how long will you be saving for, be it months or years. Moreover, should you be saving for years, there is a table underneath the savings calculator that will show you what your balance will look like at the end of each year. It's a special kind of a compound interest calculation, with a little twist - monthly deposits. Find out the price of the bike. Let's say it is 2000 € - and this is our final balance that we want to achieve. Determine your initial deposit. Let's make it 1200 €. Find out the interest rate. Let's use 5%. Last but not least, decide when do you want to finish saving. Let's say we are not in hurry and make it 2 years. By entering these data in our calculator, you will calculate that you only have to deposit 26.76 € monthly to buy that bike in 2 years. Congratulations! Determine the final balance. Let's make it 3000 €. Find out monthly balance. Let's say we can deposit 120 € monthly. Find out term. Let's say 9 months is the deadline. Finally, enter the interest rate. Let's use 7%. By entering these data you will find out that you will need to place a 1797.84 € initial deposit. In the advanced mode, you can see what's the total contribution and total interest, so that you know. The variable compounding frequency introduces some noise to calculations, go ahead and use the annual percentage yield calculator to get a more standardized picture. The investment calculator does essentially the same thing as the savings tool, but the wording is a bit different, so some people might find it less confusing and more appropriate for their own situation. Savings Calculator can be embedded on your website to enrich the content you wrote and make it easier for your visitors to understand your message.